Customer Mode: Clients can enter their profile information which is automatically synchronized with Concept. Digital Signature: Clients can sign profile cards, health questionnaires and treatment card. Check In: Check in clients via iPad with reservation lookup and check in. View Reservations and Activities of the day. The Concept iPad app for Spa and Membership businesses, implements intuitive & simple solutions. The app will enable your business to stay ahead of the competition, adding a considerable desired value to your brand and business. 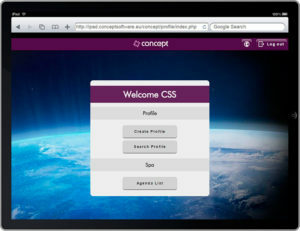 The application is aimed to improve a client´s guest experience whilst also ensuring your workflow enhancement. The concept iPad app, allows clients to easily view, create, edit or modify profile preferences – with a user-friendly way to upload and edit profile photos as well as a simplified process to update important profile contact details and addresses. The management and full access to appointment lists is also available. The app allows a clients to view appointment details quickly and efficiently, whilst the ability to update appointment status’ (managing the status from reserved, confirmed and checked-in). Your guests may also enjoy the same level of intuitive control, giving them access to update their own personal information & preferences, enhancing their own experience. The Concept Spa & Membership iPad App is the perfect tool to create easy access and management for not only your clients but also for your guests – It is simple, intuitive and efficient. Exactly as an iPad was designed to be. Feel free to Contact us for any further details on this new release. and give our clients the highest quality solutions.